Yesterday’s signals were not triggered, as there was no bearish price action when 1.1344 was reached. Trades may only be entered before 5pmLondon time today. — Short entry following a bearish price action reversal on the H1 time frame immediately upon the next touch of 1.1397. — Take off 50% of the position as profit when the price reaches 20 pips in profit and leave the remainder of the position to ride. 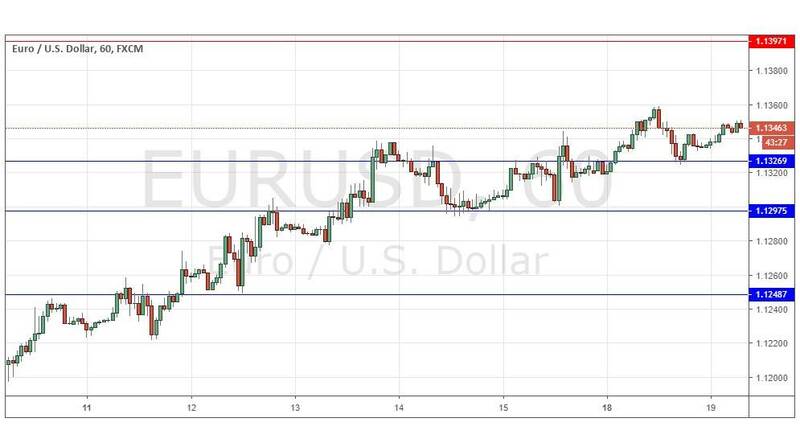 — Long entry following a bullish price action reversal on the H1 time frame immediately upon the next touch of 1.1327 or 1.1298. I wrote yesterday that a sustained break above 1.1344 would be a bullish sign, but reversals at either 1.1344 or 1.1298 could be good trades – I had no directional bias, but I thought that long trades had a better probability than short trades overall. This was a good call as the sustained break above 1.1344 did happen and has led to generally higher prices (although not by much) and there is new higher stairstep support at 1.1327.The picture is more bullish today, but bulls should be cautious that there is an unbroken swing high above the current price at 1.1360. There is nothing of high importance due today concerning the EUR or the USD. Previous articleGBP/USD 540-min – Expanding Flat Pattern?